Giantex Foldable 2 Steps Ladder, which is ideal for most tasks around the kitchen, office, bathroom, and garage. Whether it's reaching a high cabinet, changing the light bulb or washing the windows, our product will make it easier to get any job done. The 2-Step Steel Stool comes fully assembled. 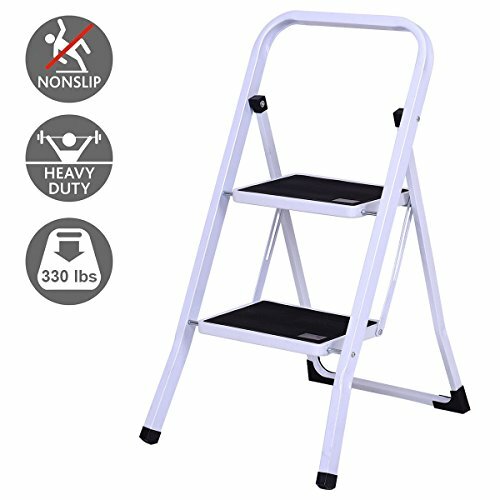 While Step Ladder is engineered to be lightweight, its heavy duty construction can hold 330 lbs of weight. With a convenient hand grip, it making the stool easy to climb and carry. It also can be used as a Chair or Little Pet Step Stool. If you are looking for an attractive appearance ladder, here it is! White frame gives an attractive appearance, which matches well with home decorate. Designed with non-marring feet keep floors avoiding scratches. Our folding 2 Step Stool also will hold up well to repeated use. It's an ideal choice either your home or shop! 【Wide Usage】Giantex foldable 2 steps ladder is ideal for most tasks around the kitchen, office, bathroom, and garage. Whether it's reaching a high cabinet, changing the light bulb or washing the windows, our product will make it easier to get any job done. 【Security & Stability】The 2-step ladder was constructed out of steel with premium screws for ultimate durability while retaining lightweight portability. The well-constructed ladder can withstand the maximum weight load of 330lbs. The ladder features convenient hand grip for easy to climb and carry, 2 wide steps with gripped treads to prevent slipping. 【Lightweight & Space-saving】Space-saving design of step stool chair allow for convenient storage and transportation. You can say goodbye to hefty stools taking up too much room. 【Modern Design】Designed with and modern metal design with a white frame which matches well with home decorate, you'll feel safe and comfortable when get to those hard to reach places. 【No Assemble Required】: Fully assembled right out of the box and ready to use. Perfect for little height in the home, office, bathroom or garage.